Mario Lemieux made it official Saturday his comeback will stretch into next season, and he's changing uniforms. At least for a couple of weeks. Canadian fans who have long dreamed of seeing No. 66 wearing the maple leaf in the Olympics will get their wish as Lemieux said for the first time he will play in the Salt Lake City Games. If Lemieux isn't injured or doesn't change his mind by next February, his presence alone could make Canada the favorite to unseat the 1998 gold medalist, the Czech Republic. Canada finished a disappointing fourth in Nagano. "I'd love to play for the Olympic team," Lemieux said before practicing for his first All-Star game since 1997. "Absolutely. No question about it. I think it is going to be very exciting and we should have a great team, and I certainly want to be a big part of it." Lemieux has yet to be officially invited, but Canada executive director Wayne Gretzky said, "I think it is pretty safe to say he is on our list." Lemieux is an American citizen, yet never gave any thought to playing for any country but his native Canada, even though Pittsburgh Penguins general manager Craig Patrick will serve in the same role with the U.S. Olympic team. The Lemieux-owned Penguins could have a formidable presence on the top Olympic teams, with Penguins scout Herb Brooks returning as U.S. coach and Penguins coach Ivan Hlinka possibly reprising his 1998 role as the Czech coach. Jaromir Jagr also is expected to play again for the Czech Republic. Lemieux played in the 1987 Canada Cup against the Soviet Union - he scored the winning goal on a setup from Gretzky - but has never played in the Olympics. The NHL never shut down its season for the Olympics until 1998, when Lemieux was retired. Lemieux's decision also guarantees he will return to the Penguins next season. Since ending his 3 1/2-year retirement, Lemieux has hinted he wants to play another 3-4 years, but Saturday marked the first time he said he would definitely play next season. "It is something I have been thinking about quite a bit the last couple of weeks, and I decided I am going to play at least a couple of more years. I'm going to finish this year and play next year, then see how it goes," Lemieux said. 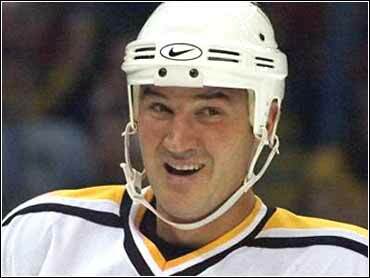 Right now, Lemieux's comeback couldn't being going much better. He admittedly still isn't 100 percent physically, yet has 16 goals and 16 assists in 16 games. He has only about half as many goals as NHL leader Pavel Bure's 31, yet hasn't ruled out winning the goal-scoring title. "I probably missed to many games to do that, but you never know," he said. "If I get a few good, hot games, I can get close to the lead. Maybe it will happen." One disappointment for Lemieux: the game still hasn't opened up the way he would like it, so much so he has personally overseen an overhaul of the Penguins' offense to make it more defense-minded. "You have to play smart hockey because every team out there is playing good defense and thinking defense first," Lemieux said. "Ten or 15 years ago, it was all offense first, and then take care of defense later. You have to be much better defensively and take care of your own end." Of course, by playing in the All-Star game and thus focusing more attention on it Lemieux also is taking care of his investment. The first owner-player to appear in an All-Star game, Lemieux is aware his dual role requires him to not only be a star, but a spokesman for the game. Lemieux is so comfortable now in such a setting that he brought his 4-year-old son, Austin, with him to his news conference. The younger Lemieux, no doubt disappointed that Jagr is injured and won't play Sunday, wore a Jagr jersey. "You appreciate it more when you are out of the game for a long time," Lemieux said. "You have a second chance to come to these events and play with the best players. So this one is very, very special."